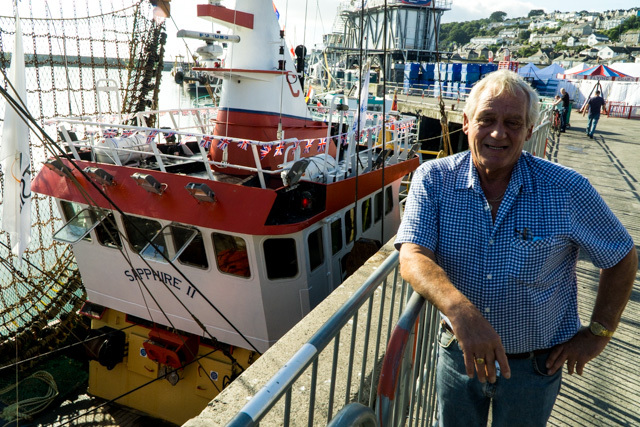 Newlyn Fish Festival 2016 in pictures! Judging by all the reports this was a great Newlyn fish festival, lots of positive comments about the number of local individuals, businesses and organisations that were involved - great produce produces great food! As ever, Passionate About Fish's husband and wife team of Sue and Duncan Lucas drew in the crowds to see their mammoth fish display while a rolling programme of top local chefs supported by cooking compere, Annie Siebert - with all the fish - just like that of the huge main display donated by the fisherman who land to the market in Newlyn. 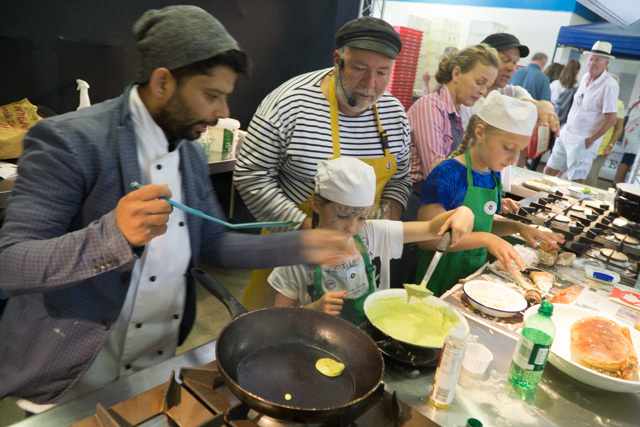 Kids form Newlyn school with Sanjay Kumar, Dan the Fishman, Annie Siebert and CWT's Matt Slater at the kitchen stage. A big shout out must go to Mark and Emma Rowse from The Real Cornish Crab Company and two of their staff, Rimantė and Dovilė who worked none-stop all day to show how it's done - even better, all the crab picked was given away in return for donations to the mission buckets on hand! In the Fish Films in the Fridge, chefs Nathan Outlaw and Paul Ainsworth flanked a huge seascape of the lugger, Ebeneezer and watched a series of films which included 8mm cine film of longlining on the Scarlet Thread and crayfish netting on the Heather Armorel lent by Robert George. This year the annual Mount's Bay Gig Club races were held as sprints in the harbour - this gave all hands ample opportunity to see the gigs race flat out the length of the harbour - a great sight and a big thank you to Tracy for organising that! 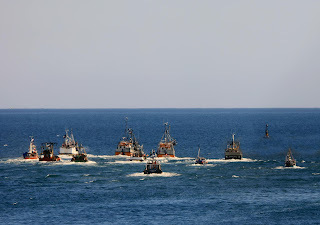 If you were lucky you would have spotted the RedArrows flying overhead on their way to the Scillys - but equally spectacular ar sea level was the trawler race - the first one to be held in modern times in Newlyn! Two boats the Raven and the Tori Gwynt tied for first place in the punt's race and walked off with a lobster pot each kindly donated by pot maker Chris Martin and oilskins from Mike Cornish. The newly created trophy for the race is the Cod Cup, in honour and recognition of the hard life that single-handed fishermen lead - none more so than Stephen 'Cod" Astley whom the trophy is to be named after. Following the punt race (and we are sure next year there will be many more entrants) 10 bigger boats battled it out in the trawler race - with a trophy promised for the first sardine boat home. To say competition between some of the boats was fierce would be something of an understatement - hundreds of eggs and the deck hoses were used during the parade of boats before the start - and during the race. With the afternoon sun streaming across the bay the ten boats made a spectacular sight as they steamed towards the first mark, the Low Lee Buoy. 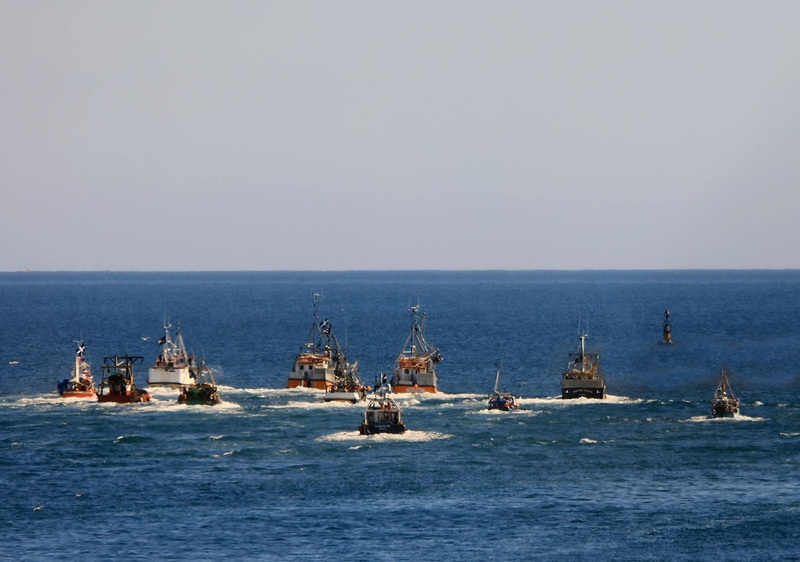 All 10 trawlers steaming flat out for Low Lee buoy. Race results can be seen on the Fish Festival website. Suffice to say, the first boat home was a sardine boat so they cleaned up on the prizes donated by Survitec, Dunlop, Gael Force and J Reid. The Cornish Ice Company also promised to provide a trip of ice to the winning boat! Paul and Mike Corin's Sapphire II looked superb in the sun. All in all it was a great day for all concerned - especially as this year saw fishermen become more directly involved - skippers Alan Nudd, Richard Carrol and Paul Corin and their crews going to the trouble of decorating and mooring their boats so festival visitors could get a close-up look were especially appreciated! Last, but not least, a big thank you to Newlyn Harbourmaster Rob Parsons and crew for letting it all happen on his patch!